URS Middle East has awarded the Sheraton Al Khalidiya Hotel in Abu Dhabi with the HACCP Certification. The certification demonstrates the hotel’s commitment to food safety and its compliance with international standards for food safety and quality. The hotel is host to a few restaurants, apart from providing in-room dining service, where it caters to the varied dining needs of its guests. This presents a unique challenge to its Food and Beverage department which is responsible for maintaining high quality in the food and drinks it prepares and for the safe storage and maintenance of food items on an on-going basis. All of these procedures are also required to be in strict compliance with local government regulations for food safety. URS Middle East was chosen to appraise its food safety procedures and certify it for the HACCP Certification. 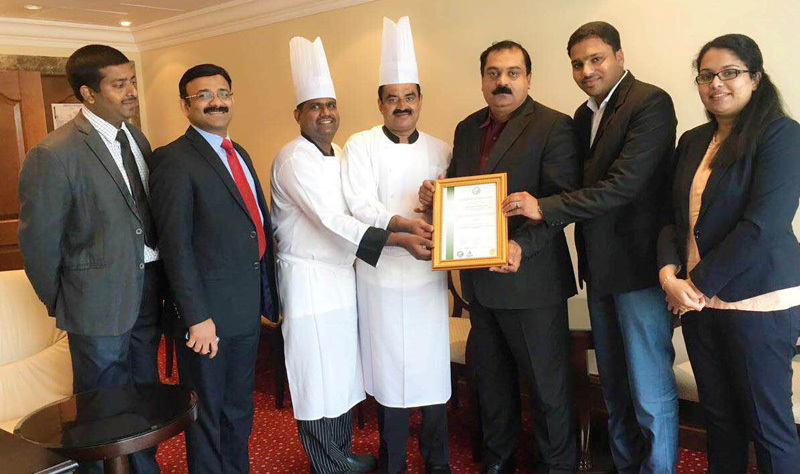 Neelesh Sinha, Director at URS Middle East said, “It was a great honour for us to work with the team at Sheraton who exhibited a unique level of commitment and enthusiasm towards maintaining high safety standards in the food production and preparation process. We congratulate them on achieving this certification”. With this certification, the hotel has demonstrated its commitment to foster a culture of quality and excellence among its staff and maintain the highest food safety standards of the industry while also monitoring the safety of their staff. HACCP is a food safety management system where every step in the preparation, storage and distribution of food and raw materials are analyzed for chemical, microbiological, and physical hazards. The Sheraton Al Khalidiya Hotel, Abu Dhabi brings the best of the UAE capital at your fingertips. If offers luxurious guest rooms and suites – ideal for all kinds of travellers. Conveniently located near the city’s business district, with great shopping and dining options, the spectacular Abu Dhabi Corniche. The hotel offers in-house dining options apart from in-room dining.